Spiralizing vegetables is a fun way to get more veggies into your diet. This recipe uses parsnips, a seasonal root vegetable, in place of the rice noodles that you would find in traditional Vietnamese pho soup. This simple dish comes together quickly and is easily adaptable, so feel free to include other vegetables of your choosing. Note: This recipe requires a spiralizer to create the parsnip noodles. If you do not have a spiralizer, check the produce section in your local health food store for pre-spiralized vegetable noodles. Add the cinnamon sticks, star anise, garlic, ginger, onion, broth and coconut aminos to a large pot. Bring to a boil, reduce heat, cover, and simmer for 20 minutes. Remove and discard the cinnamon stick and star anise. Add the chicken and parsnip noodles. Simmer for 2–3 minutes, or until the noodles are just tender. 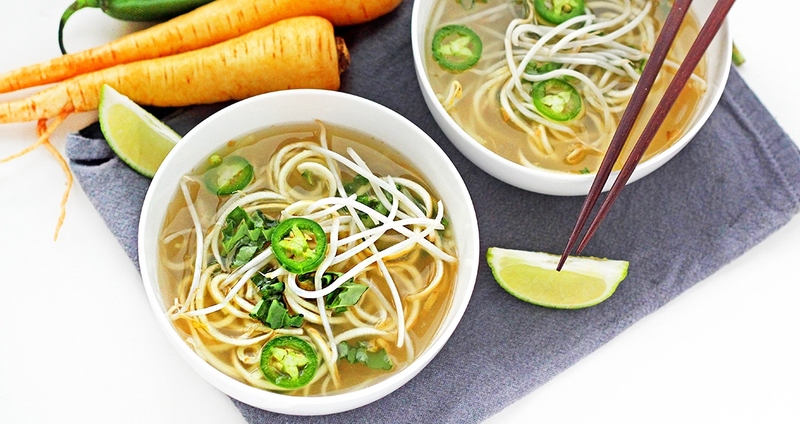 Serve hot with lime wedges, basil, bean sprouts and jalapeño slices.